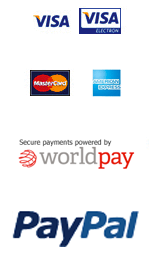 We also accept national and international bank transfer (BACS) payments in UK pounds sterling only. If you choose this method you will be given our BACS information and IBAN/Swift number on completion of transaction. Once payment is confirmed we will aim to; despatch your instruments within two weeks from order unless otherwise stated on the purchase page. Find out more about buying multiple instruments, availability and discounted instruments on the shop page.